If you're a business owner looking for a great credit card for your company, we've got you covered. With features like expenditure tracking, generous rewards programs, and flexible redemption options, business credit cards are tailored to help your company benefit from everyday spending. Our experts have reviewed hundreds of cards to identify the best credit cards to help protect your company's financial health. Here are some of the best small business credit cards from our partners. Commonly used for: Auto Rental Insurance, EMV, Extended Warranty Program, Mobile Pay Ready, Purchase Protection, Travel Accident Insurance, Travel Assistance, Unsecured credit card, Zero Fraud Liability. The introductory sign-up bonus offer will make any small business take a second look at the Capital One Spark Cash for Business. Earn a one-time $500 cash bonus once you spend $4,500 on purchases within 3 months from account opening. Combine the valuable sign-up offer with this card's easy-to-understand rewards program, and you can see why we recommend this card. Businesses will enjoy 2% cash back on all purchases along with additional employee cards at no extra cost. If you are looking for a business card for general spending that doesn't require category tracking or niche spending, the Capital One Spark Cash for Business is an excellent choice. Commonly used for: 0% Introductory APR, Auto Rental Insurance, EMV, Extended Warranty Program, Mobile Pay Ready, Travel Accident Insurance, Travel Assistance, Zero Fraud Liability. This card’s straightforward rewards, easy redemption, and easy-to-get $200 cash sign-up bonus (after you spend $3,000 in the first 3 months of account opening) make this a solid choice for businesses. Better yet, with the Capital One Spark Cash Select for Business, there is no annual fee. This is a great choice for a small business that requires a good all-rounder with added benefits like free employee cards. 5% cash back on the first $50,000 spent at wireless telephone services purchased directly from U.S. service providers and U.S. office supply stores 3% cash back on the first $50,000 spent in the category of your choice from a list of eight 1% cash back on other purchases. Commonly used for: 0% Introductory APR, Auto Rental Insurance, EMV, Extended Warranty Program, Lost Luggage Reimbursement, Mobile Pay Ready, Presale Tickets, Purchase Protection, Travel Accident Insurance, Zero Fraud Liability. Rating a card as “best for office supplies” may not sound like the sexiest credit card review but office managers and business owners know how quickly those office supply costs stack up. This card is a good way for you to earn a great rate of cash back on dollars you were already spending. A 5% cash-back rate on U.S wireless telephone services and U.S. office supplies stores (for the first $50,000 spent) is very generous, and the 3% return on a category of your choice (for the first $50,000 spent) allows you the flexibility to make this card work for your business. Better still, this card simply pays your cash back in the form of monthly statement credit so you don’t have to worry about points, miles, or gift cards. Commonly used for: 0% Introductory APR, Auto Rental Insurance, EMV, Extended Warranty Program, FICO Score, Lost Luggage Reimbursement, MasterCard World, Mobile Pay Ready, Purchase Protection, Travel Accident Insurance, Unsecured credit card, Zero Fraud Liability. The sky's the limit with the Bank of America® Business Advantage Cash Rewards Mastercard® credit card. The card’s ample cash back rewards have no cap and the choice categories are focused on common business expenditures. Choose from one of six: gas stations, office supply stores, travel, TV/telecom & wireless, computer services or business consulting services. This seems almost too good to be true when you consider this card charges no annual fee and cash back rewards don’t expire. Commonly used for: 0% Introductory APR, Auto Rental Insurance, EMV, Extended Warranty Program, Lost Luggage Reimbursement, Mobile Pay Ready, Points, Presale Tickets, Purchase Protection, Roadside Assistance, Travel Accident Insurance, Unsecured credit card, Zero Fraud Liability. 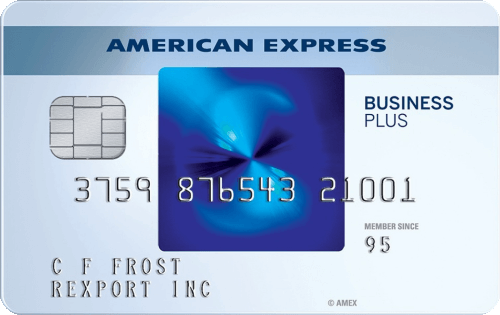 The Blue Business Plus Credit Card from American Express is a business credit card with a flat 2X rewards rate on up to $50,000 in purchases. Where this card really sets itself apart from other business cards is in its introductory 12-month 0% balance transfer APR offer (after that,15.49%, 18.49% or 21.49% variable based on your creditworthiness and other factors as determined at the time of account opening). If you need to consolidate business debt and have a good-excellent credit score, this card is a fantastic choice. Commonly used for: Auto Rental Insurance, EMV, Extended Warranty Program, Mobile Pay Ready, Points, Travel Accident Insurance, Travel Assistance, Unsecured credit card, Zero Fraud Liability. The Capital One® Spark® Miles for Business offers a generous one-time bonus of 50,000 miles once you spend $4,500 on purchases within 3 months from account opening. Miles are accrued on this card at a rate of 2 miles for every $1 spent which is competitive in the Business Rewards card space. What sets this card apart is the flexibility of redemption: Miles don’t expire and you can redeem miles for travel or cash back with no limiting categories. This is a great no-hassle card with a sign-up bonus that immediately juices the returns. Commonly used for: 0% Introductory APR, Auto Rental Insurance, EMV, Extended Warranty Program, Mobile Pay Ready, Points, Travel Accident Insurance, Travel Assistance, Unsecured credit card, Zero Fraud Liability. The Capital One Spark Miles Select for Business offers a competitive sign-up bonus along with a straightforward and valuable rewards program. While another card may provide more rewards-earning potential, this card stands out because it charges no annual fee. Get 5X Membership Rewards® points on flights and prepaid hotels on amextravel.com. Get 50% more Membership Rewards® points. That's 1.5 points per dollar, on each eligible purchase of $5,000 or more. You can get up to 1 million additional points per year. Welcome Offer: Earn up to 75,000 Membership Rewards® points. Earn 50,000 Membership Rewards® points after you spend $10,000 and an extra 25,000 points after you spend an additional $10,000 all on qualifying purchases within your first 3 months of Card Membership. Commonly used for: Airport Lounge Access, Annual Travel Credit, Auto Rental Insurance, Charge card, Companion Ticket, Concierge Service, Elite Status, EMV, Extended Warranty Program, Free Wi-Fi Access, Mobile Pay Ready, Points, Presale Tickets, Private Jet Access, Purchase Protection, Roadside Assistance, Travel Accident Insurance, TSA/Customs Reimbursement, Ultra-Premium Card, Zero Fraud Liability. The list of benefits and additional perks offered with this card is extremely long. For businesses where cardholders cover a lot of distance and like to travel in style, this is the card for you. 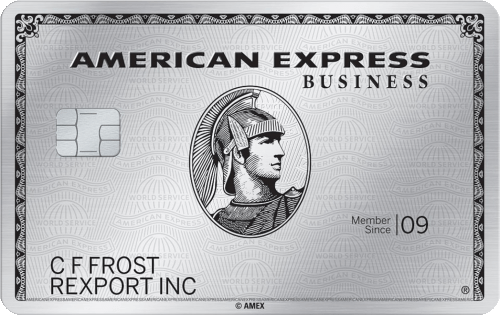 American Express’ generous welcome offer, 5x membership rewards on flight and prepaid hotels booked through Amex, and 35% airline spending bonus will deliver excellent returns for cardholders who spend heavily enough in these categories. The card really shines with the additional value it adds for long-distance or very frequent travelers. Perks such as access to The American Express Global Lounge Collection and extra points on first and business class flights will be highly prized by certain cardholders. Commonly used for: Auto Rental Insurance, Charge card, EMV, Extended Warranty Program, Lost Luggage Reimbursement, Mobile Pay Ready, Points, Presale Tickets, Purchase Protection, Travel Accident Insurance, Zero Fraud Liability. For small business owners, this card offers a lot of value despite the hefty annual fee. The flexible rewards structure means that, for most businesses, you can get the highest rewards rates on your highest spend areas. The card offers 4x points on two categories of your choosing, up to $150,000 in combined purchases per calendar year, eligible purchases in excess of that amount will still get 1x point per dollar. Many of the categories to choose from tend to be heavy-spend for a lot of businesses which means cash back rewards will stack up fast. Commonly used for: Auto Rental Insurance, Companion Ticket, Concierge Service, EMV, Extended Warranty Program, Free Checked Baggage, Free Credit Score, Lost Luggage Reimbursement, MasterCard World, Mobile Pay Ready, Presale Tickets, Price Protection, Primary Auto Rental Insurance, Priority Boarding, Purchase Protection, Roadside Assistance, Travel Accident Insurance, Unsecured credit card, Zero Fraud Liability. 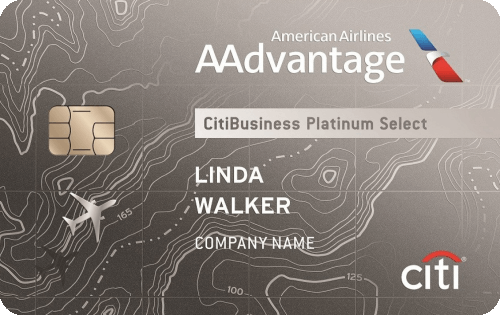 This co-branded card from Citi and American Airlines is great for business travelers who fly American frequently. Even if you don't, American Airlines is part of the OneWorld alliance and has a great transfer program. What makes this card really stand out from other airline business cards is its bonus categories - you get rewarded for purchases at gas stations, car rentals, and more - not just purchases with the airline. Have questions for our credit cards editors? Feel free to send us an email, find us on Facebook, or Tweet us @Bankrate. Bankrate’s team of financial services experts have been offering thoughtful, well-researched advice for many years. We understand that there is no one-size-fits-all solution to your business-related financial concerns because every business is different. By offering impartial guidance we hope we can help you to make the most informed decision. Great business credit cards help to make your life as a small business owner easier. Whether that be through cash back rewards on your spending, or travel perks such as lounge access. Each small business credit card has been assigned a Bankrate score out of 100. A lot of factors are considered to reach this score but rewards value, sign-up bonus, annual fee and any extras or discounts, were more heavily weighted for this category. The highest rated card may not be the best card for you, you know your own business the best, so we have simply tried to give you all the information you need to make your choice. Rewards value: Small business owners should expect a suite of rewards with their business credit cards. Annual fee: Many business card providers offer promotional discounts on their annual fee for the first year. We help to identify where an annual fee is worth the expense and tell you how much you would need to spend on your card to cover the annual charge. Sign-up bonus: A lot of business credit cards will have very generous sign-up bonuses. We analyze the value of the bonus. Extras and discounts: Advantages such as free employee cards and rental car coverage are useful benefits for small businesses. The Capital One Spark Cash for Business card is great for big-spending business owners who want a generous cash-back rewards program. With unlimited cash-back earnings and straightforward redemption options, simplicity is one of its biggest perks. The introductory bonus offer is nothing to scoff at either. Earn a one-time $500 cash bonus once you spend $4,500 on purchases within 3 months from account opening. However, we caution any cardholder to avoid carrying a balance in order to not incur interest. With this card sitting at an 19.24% variable APR, which is slightly higher than other cards, doing so would ultimately negate any cash back returns. This card earns an unlimited 2% cash back on every purchase. The card carries a $95 annual fee, which is waived the first year. There are no foreign transaction fees, so if you or your employees need to do business outside the U.S., you won’t have to pay extra for using this credit card. The Capital One® Spark® Cash Select for Business is a straightforward no annual fee business rewards card. If you’re just making the move to a small-business card this should be one to consider. It earns an unlimited 1.5% cash back on all your purchases, which will stack up quickly if you’re charging all your business expenses to the card. Capital One is also currently offering a one-time $200 cash bonus after you spend $3,000 in the first three months of opening the account. 1.5% unlimited cash back on all your purchases. One-time $200 cash bonus after you spend $3,000 on purchases within 3 months after you open your account. The SimplyCash Plus Business Card from American Express is great for businesses who spend big through U.S. service providers and U.S. office supply stores. Earn 5 percent back on spending at U.S. office supply stores and on wireless telephone services purchased directly from U.S. service providers. There is an annual maximum of $50,000, then the rewards rate drops to an unlimited 1% on those purchases. Airfare purchased directly from airlines. Hotel rooms purchased directly from hotels. Car rentals purchased from select car rental companies. U.S. purchases for advertising in select media. U.S. computer hardware, software, and cloud computing purchases made directly from select providers. Cash-back earnings are automatically credited to your statement. You can spend above your credit limit and still earn rewards on that amount. Any business owner who’s often on the open road will likely benefit from this card’s rewards structure. The Bank of America® Business Advantage Cash Rewards Mastercard® has gas stations as one of six choice categories that earn 3% cash back. The other categories are office supply stores, travel, TV/telecom and wireless, computer services and business consulting services. You also earn 2% cash back on dining (for the first $50,000 in combined choice category/dining purchases each calendar year, 1% thereafter) and 1% cash back on all other purchases. Take note of the card’s limitations: You can redeem cash rewards only for a statement credit, a check or cash deposit into a Bank of America account (you can’t transfer rewards to other loyalty programs). Gas stations are the default choice category, so you’ll need to make a change if you want to opt for a different category. You get a $300 statement credit when you make at least $3,000 in net purchases within 90 days of your account opening. 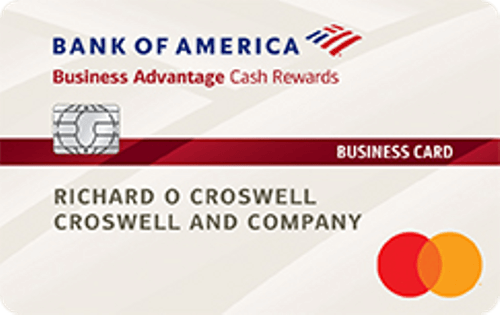 If you’re a Business Advantage Relationship Rewards Platinum Honors tier client with Bank of America, you can stack a 75% rewards bonus on every purchase. That bonus means you earn 5.25% on your selected choice category, 3.5% on dining and unlimited 1.75% cash back on all other purchases. There’s no annual fee, no cap on cash rewards earnings and no expiration of your cash rewards. If you’re looking to consolidate business debt, or spread out the cost of a big purchase, (and you have a good-excellent credit score) this card is a great choice as it offers a 12-month introductory 0% APR period on purchases and balance transfers (then a variable: 15.49% – 21.49%, based on your creditworthiness and other factors as determined at the time of account opening). This card also currently offers a very compelling flat rate 2x rewards on up to $50,000 in purchases every year. 2X points on everyday business purchases such as office supplies or client dinners (up to $50,000 per year, then 1x points). 12-month 0% introductory APR on purchases and balance transfers (terms apply). 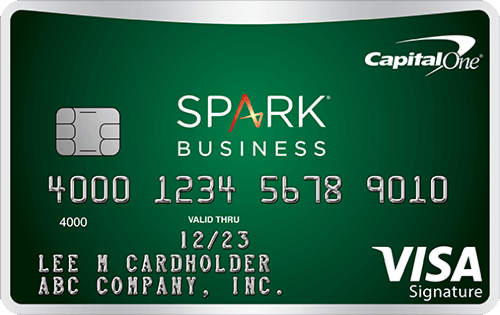 For simple travel rewards the Capital One® Spark® Miles for Business card is hard to beat. Although non-travelers will probably be better served with the Capital One Spark Cash for Business, the Spark Miles for Business card ranks among the best business travel rewards cards on the market. With this card, you will earn 2 miles for every $1 you spend with no categories to keep track of or limit you. Soon cardholders will be able to transfer these miles to around a dozen airline programs at great transfer rates. If your business has varied expenses that aren’t concentrated into typical business spend categories like office supply stores then this card offers extra flexibility. As it charges no foreign transaction fees, if your travel takes you outside of the U.S., you won’t rack up extra fees. Overall, this card is a good fit for business owners who travel often but want to avoid the complexity associated with some travel rewards card. Earn a one-time bonus of 50,000 miles once you spend $4,500 on purchases within 3 months from account opening. Additional employee cards at no charge. The Capital One Spark Miles Select for Business is best for the frequent business traveler. It comes with a solid 20K-mile intro bonus when you spend $3,000 within the first 3 months from account opening and earns 1.5 miles per dollar on all purchases. Those miles can be redeemed for travel purchases through the Capital One travel portal, or get a statement credit back against travel expenses you booked on your own using the card. And with no annual or foreign transaction fees, hitting the road is much less of a hassle. Rewards are unlimited and never expire, as long as the account is open and in good standing. The card comes with comes with Visa Business Benefits, which includes auto damage protection, emergency and travel assistance and purchase protection. Additional employee cards are free and the main account holder accrues rewards earned on those cards. For business travelers who want to fly in style and don’t mind paying the price, the Business Platinum Card from American Express delivers the goods. This card comes with a big welcome bonus of up to 75K points if you spend $20K in the first three months. Get 5:1 points per dollar flights and prepaid hotels through amextravel.com and 2:1 points per dollar travel purchases booked online through an American Express. With that comes access to nearly all of the airport lounges you can think of across the globe. There are a few things to consider, however. One is the high spending requirement to earn the bonus ($20,000 in the first three months). Another is the $595 annual fee. So, if you’re a small business owner with a minimal budget, consider if this card is worth it for you. Cardholders have access to American Express’ exclusive Centurion Lounge, a perk reserved just for Platinum and Centurion cardholders. Cardholders get up to $200 back as a statement credit in airline incidental fees. All flights and prepaid hotels booked on the Amex Travel Website will earn 5 points per dollar spent. 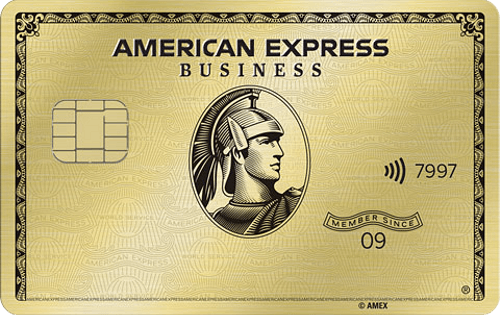 The American Express Business Gold Card from is a fantastic option for small business owners who don’t spend as much as the big guys but still want good point redemption. 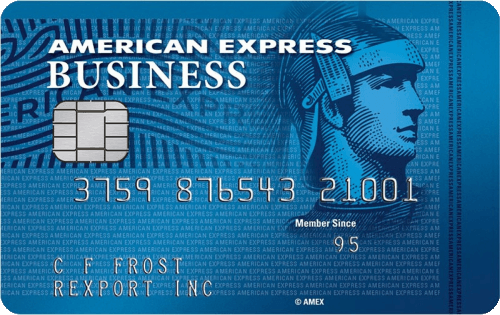 American Express will automatically award 4X points to the two categories where your business spends the most each month (up to 150,000 in combined purchases each year). It feels as though American Express really considered small business owners when designing the rewards profile and perks of this card. Access to expense management tools like Quickbooks and 1-year free subscription to ZipRecruiter Standard and G Suite Basics (for up to three users) are hugely beneficial for a lot of growing business. These added extras also make for a decent return on the $295 annual fee. Earn 4x Membership Rewards points (up to $150,000 in combined purchases per calendar year) in the two categories where your business spends the most. Access to American Express’ Pay Over Time Option that helps manage cash flow on purchases over $100. Business credit cards are for businesses large and small. As a sole proprietor, business owner, or freelancer you can qualify for a business credit card. They are simply credit cards that are designed to be used by businesses instead of for personal use. Even though they are designed for business use they are practical for similar reasons as personal credit cards; they can provide businesses with returns on their everyday spending, help to cover expenses during seasonal periods and help businesses build credit which will make it easier to borrow in the future. Many credit card issuers offer business credit cards and the application process is very similar to the process for a personal credit card. For small businesses, cards are often secured by a personal guarantee. For freelancers and sole proprietors, you may only be asked to provide the basic information — name, social security number, income etc. — that you would be on an application for a personal credit card. If your business is structured as an LLC (single-member or partnership) or as a corporation, you will be asked to provide information on your business — the company name, TIN, address, business income. For more detailed information on how to apply for a business card, check out our handy guide. Business credit cards help to keep personal and business spending separate. Although, the main advantage of a business credit card is the rewards. These cards typically offer high-value rewards for everyday purchases, allowing you to save money on required expenditures. What are some pros and cons? Rewards on purchases is a major incentive for getting a business card. Many offer higher rates on business-related spending like office supply stores. Using a business credit card helps your business build a credit profile. Many business cards offer quarterly and year-end summaries to track expenditures. Putting all expenses on one card can make accounting more straightforward. It can be easier to qualify for a business credit card than a line of credit or a bank loan. A business credit card can be useful when you’re experiencing cash flow concerns. You may be personally liable for any unpaid debt on the card in some cases, which can affect your personal credit score. Due to the high rate of interest business credit cards shouldn’t be used as a form of financing. If you do carry a balance you could incur some very high costs. Just about any business owner can benefit from a business credit card, even if your venture is more Mom & Pop than Dun & Bradstreet. More purchasing power. A higher credit limit will come in handy if, for example, you have to buy several 50-pound cases of chicken for your restaurant or a $1,000 conference table for your office. More business-related rewards categories. You can earn cash back on purchases of advertising, shipping, software and more. More business-friendly options. Some card issuers have deferred payment policies tailored to the demands of operating a business. A business credit card can make your life easier in other ways. For one, it provides an automatic method of keeping business expenses separate from personal expenses, which makes tax records less hard to unravel. Also, you can deduct most work-related expenses on your businesses’ tax return, including your business card’s annual fee and any interest accrued. Sole proprietorships or side-hustle businesses: Even if you’re a party of one, you can benefit from keeping your business expenses separate from your personal spending. Having a dedicated card can not only make things easier for accounting purposes, it can also help you save money. Consider the areas where you spend the most to find the right card. For example, if you’re selling goods or services online, a card that pays rewards for Internet access or online advertising may be the right fit. General partnerships of two or more people: If you’re a small business with a small staff, you may want to consider a business credit card that includes free employee cards. The main cardholder will accrue any rewards and monthly statements will show a breakdown of which employee spent what on which card. If you own the type of business that provides delivery services. For example, a card with enhanced rewards on gas spending could be a good choice. Tech-heavy businesses: If most of your spending is on computers and technology related spending, consider a card that offers benefits in these areas. Or, if your expenses are varied, a flat-rate rewards card that offers the same rewards no matter what you’re buying may be the right one. Travel-based businesses: Anyone with a business where employees are frequently on the go by plane, car or overnight in a hotel should consider a business credit card that offers travel rewards. Many of the travel-related business credit cards offer perks beyond the rewards structure like free Wi-Fi, priority boarding and other benefits. Keep in mind, if the travel is international, choosing a business card without foreign transaction fees should be at the top of your list. If your business is just starting out when you apply for a business credit card the issuer will look at your personal credit score to determine creditworthiness. Just like with personal credit cards, business credit cards will require the applicant to have at least good credit and some require an excellent credit score. When you apply, you’ll have to state your total income. This means your income from the business you want the card for and any other income. For example, if you’re just a few months into the business and you’ve earned $1,000 from your new venture but your day job earns you an annual salary of $50,000, your total income should be listed as $51,000. More established businesses will apply using their company’s Employee Identification Number (EIN) but even then, the applicant is still held responsible for paying the credit card bills. If you miss a payment or pay late on your business credit card, it will show up on your personal credit report. Most businesses require some capital to get started and keep going until they make a profit. There are pros and cons to using a credit card or a loan to get your business up and running. Generally speaking, a business credit card is easier to get then a business loan. With a business credit card, you may still qualify for some types of cards even if your credit is just average. There are also a handful of secured business credit cards that you can get even if your overall credit score is less than stellar. A business loan, however, would be nearly impossible to get from a lender with anything other than a strong credit profile as you’d be deemed too big of a risk. Applying for a business credit card is usually much faster than applying for a business loan, which can take months to get approval for. A business loan may also require collateral, which can be risky if your business tanks or runs into financial trouble. You should know that a business loan will also typically have much lower interest rates than a business credit card. If you think you’ll typically carry a balance on a credit card, a lump-sum business loan could be a better choice. But if you’re able to pay the bills in full every month, you could benefit from having a business credit card that offers rewards as cash-back or can be redeemed for travel. Use a business loan calculator to see if the terms are more favorable than what a business credit card may offer. The single biggest tip is to put in the homework to find a card that will work for you. The right business card should have a rewards structure that compliments your existing spending. It pays to review your business spending and break out the categories where you spend the most. If you’re planning on making a large purchase — perhaps, investing in some equipment to grow your business — it’s worth finding a card with a long 0% introductory APR offer to help you spread out your payments. If you know there may be times — perhaps, due to the seasonal nature of your business — where you risk carrying a balance you should prioritize a low standard APR card. The fact of the matter is that you know your business best. It’s our job to give you all the information you need so you can identify the best card for you. Be careful. Some credit card companies will check your personal credit history when you apply for a business card. It’s important to ask the credit card company if they’ll be reviewing your personal history. Your personal credit could be impacted by any debt on the business card and this is worth considering. Make sure to use your business card! This may sound like an obvious one but there are a lot of business cards out there gathering dust in wallets. The more you use your card, the more rewards you will receive. And, on the topic of rewards, make sure to redeem these too. They can deliver additional value to your business in the form of cash back but they also offer business owners and employees nice perks such as airport lounge access and upgrades. Need to do more research for your business? Finding the right credit card for your business is a tough decision. If you still feel like you need to do more research, we have you covered. Our team of credit card experts have reviews on all of the major business credit cards on the market today and keep them up-to-date with the latest offers and our opinions on them. Just follow the link below and browse through all of our reviews. For rates and fees of the SimplyCash Plus Business Credit Card, please click here.